na me. We met up with the couple that we had met during the Summer of Love dinner a month back. They were chomping at the bit for a more fulfilling experience this time around. 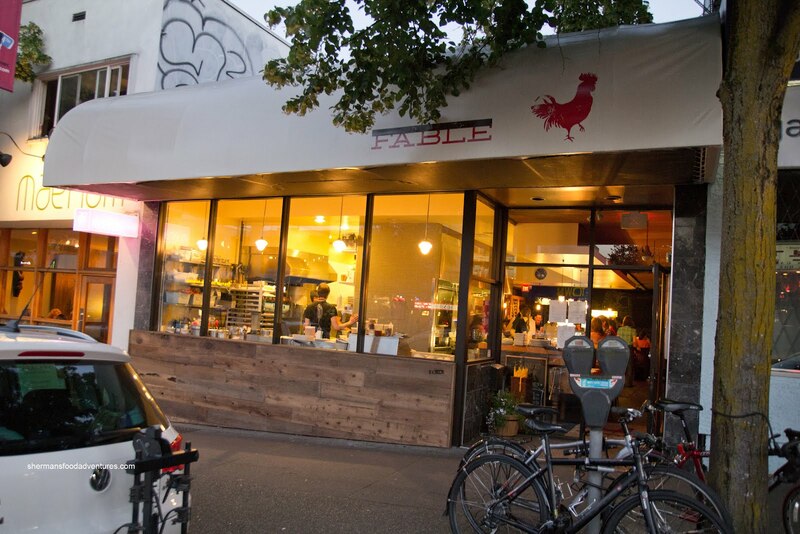 Located at the former Re-Fuel (and before that Fuel), the layout for Fable remains mostly the same with an open kitchen at the entrance. The dining room is at the back with very little natural light (bad for pictures!). 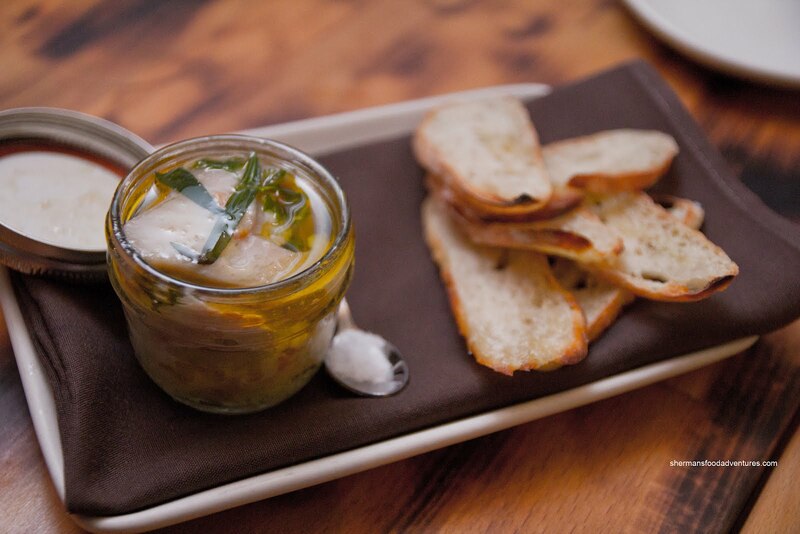 With a focused menu, we planned on trying most of their dishes starting with the Sawmill Bay Oysters. 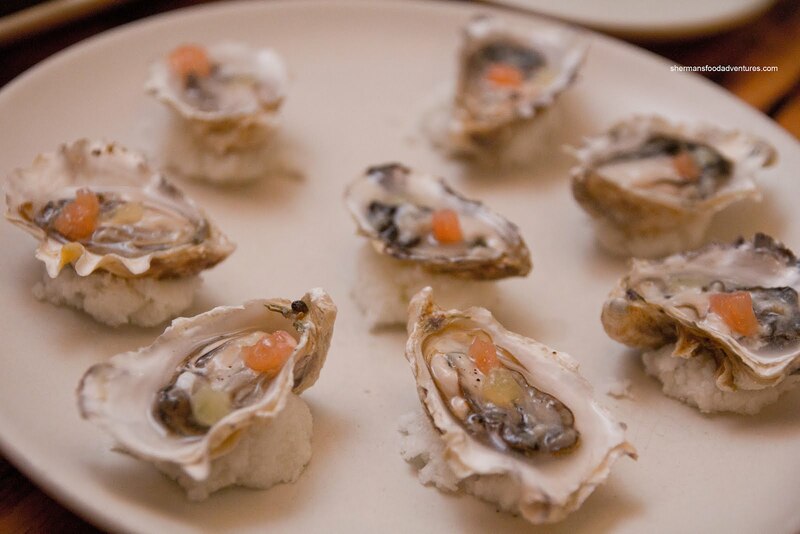 These little oysters were accented by a vodka mignonette with citrus bits. These were sweet and a good start to the meal. 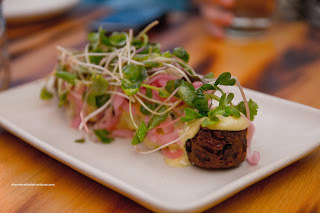 Next up was the Chickpea Fritter with pickled red onion, pea shoots and curry mayo. One bite into these falafel-like fritters and a whoosh of curry hit our senses. They were not dense, yet could've been slightly crunchier. The pickled onions added the necessary zing to brighten up the dish. The soothing mayo added another layer of curry as well as moisture to the fritters. 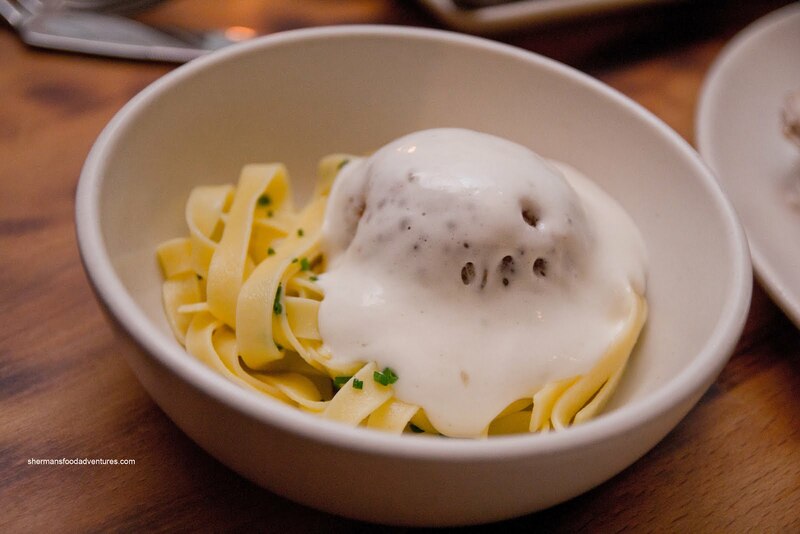 Probably our favourite appie was the Spaghetti and Meatballs, which was really tagliatelle and a duck meatball. Crispy outside and meaty/ducky inside, the meatball was money. There was a lot of flavour including a hit of liquorice which I suspect was star anise. The pasta was perfectly al dente. The sauce was a combination of duck jus and Parmesan foam. A good combination of flavours and there was no mistaking the star of the dish which was the duck. From our favourite to the most interesting appie, we had the Canned Tuna which was a concoction of albacore, potatoes, tomato and olive oil sous-vide in a jar with crostinis on the side. The result was super moist tuna and potatoes which could literally be spread onto the crostini if one wanted to. We didn't do that though. The richness of the olive oil combined with a noticeable lemon kick resulted in a nice balance of flavours. Moving onto the mains, they came in 2 waves because we wanted to share them without worrying about anything getting cold. Arriving first and majestically plated was the Potato Crusted Chicken resting on ratatouille. This was a large portion which would be more than enough for one person. The chicken was moist and tender which was a great contrast to the very crispy exterior. It was like crunchy shredded hashbrowns on the outside. The ratatouille was tart and offered up some acidity to the dish. We thought this was executed well. 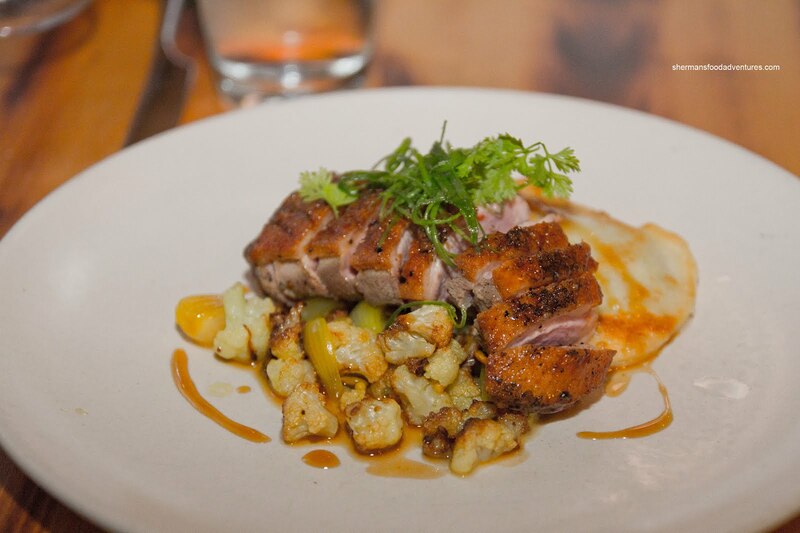 From one fowl to another, we had the Duck Breast with scallion perogies and sauteed cauliflower. Although the duck meat wasn't as pink as we would've liked, the meat was still moist and easy to chew. The skin had a nice colour, yet could've stood to be crispier. The perogi was very soft with a slightly runny filling. No real issue for me since I don't like overly dense perogies anyways. Besides, the filling was well-seasoned. The little cauliflower florets were just cooked retaining a bit of crunch. So far so good with all the plates we had until the Halibut & Chorizo served in a "chowder" with mussels, tomatoes, chives and fennel. There was nothing inherently wrong with the chowder as it was creamy with lots of chorizo goodness. Furthermore, it had a spicy kick and really benefited from the fennel. 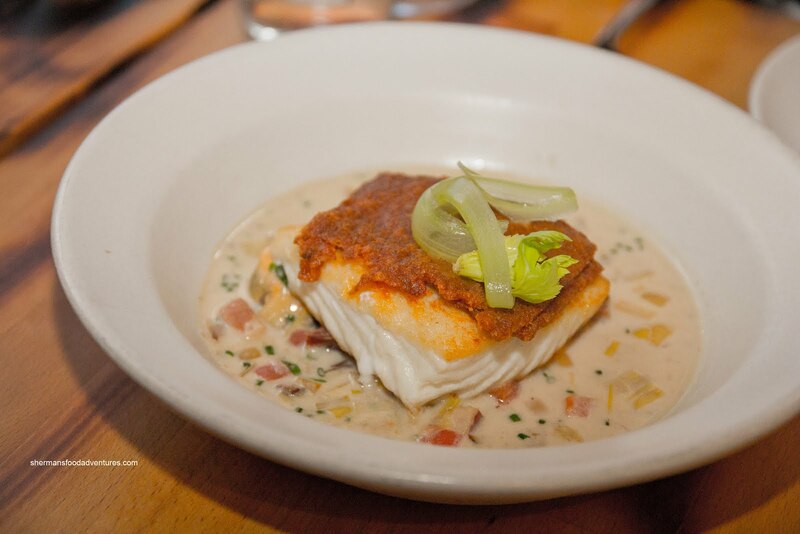 The problem was the halibut itself as it was not flaky. In fact, it was mushy. We were perplexed as we were confident that they would not knowingly use a bad ingredient. But the texture of the fish was just not right. Too bad really since the dish itself was quite pleasant. 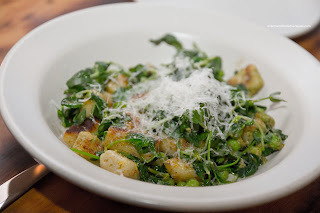 Lastly, we had the Gnocchi with pesto, pea shoots and sweet peas. The gnocchi was too soft and mushy. It was almost slimy in texture and highly unappealing. Again, that was unfortunate since the flavours of the dish really sang. There was a fair amount of lemon which combined with the sweet peas to form a nice balance. If only the gnocchi were better, this would've been a solid dish. After this, we decided to share 3 desserts. 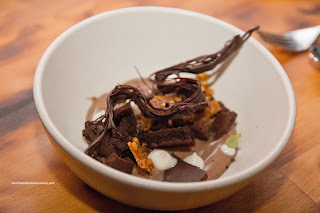 The first was the Chocolate Pudding with cinnamon, walnut praline and "bits of pieces". This was a fairly small dessert with more stuff than pudding itself. There was a chocolate twizzle along with brownie bits and crunchy praline. Lots of textures and plenty of chocolate goodness. There just wasn't a lot of pudding (which was smooth and sweet). 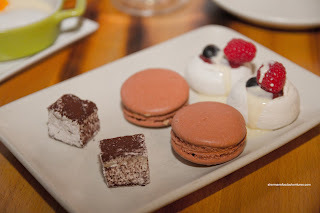 Our second dessert was the Daily Sweet Bites consisting of mini-pavlovas, dulce de leche macarons and marshmallows dusted with cocoa powder. The pavlovas were crisp on the outside and airy on the inside with a sweet raspberry jam. As for the macarons, they were pretty good with a crisp exterior yielding to a light inside which was only slightly chewy. It was only semi-sweet. Looks like the judges got it right on Top Chef Canada regarding Curtis' macarons. The marshmallows were soft and fresh. They were sweet, but not incredibly so. Last but not least was the dessert I was waiting for - Lemon Pot de Creme. This was topped with lemon granita and gin foam. Oh yeah, this was my favourite dessert (since I love lemon sweets and in fact, it was good too). It was super smooth, silky and only semi-sweet. The lemon hit was doubled by the tangy granita on top. The gin foam was pretty light only marginally impacted the dessert (which it should anyways). So the meal started off strong and maintained momentum until the Halibut and Gnocchi. 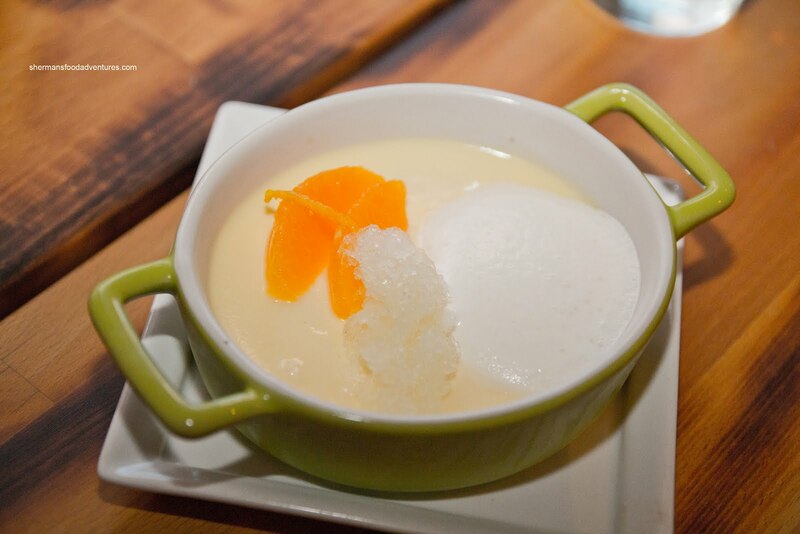 It was revived at the desserts and finished nicely with the Lemon Pot de Creme. Naturally, no meal will ever be perfect because there are so many variables in running a restaurant - from the busy kitchen, equipment and raw ingredients. 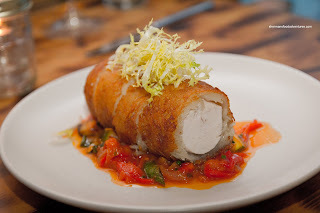 Therefore, if we had to look at the good dishes, they far outnumbered the bad ones. Hence, the meal could be deemed a success. We enjoyed the different approaches to seemingly standard dishes and also the whimsical interpretations of some items such as the Canned Tuna. Prices are on the higher side, yet not totally out-of-line considering the location. 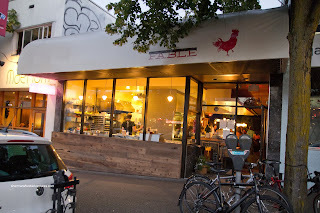 Then again, chain restaurants charge almost as much and I'd much rather eat at a place like Fable.